If you’re an organic gardener, you probably know what we’re about to say about soil science. If you are just now considering going organic in your garden, then you’ve come to the right place. Gardening organically is much easier than most people think. 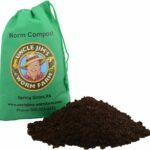 Instead of loading your soil with chemical fertilizers to make up for the organic matter, nutrients and microbes that are missing, you replace them. 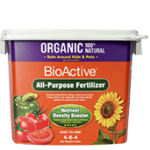 Once you replace the organic matter, nutrients and microbes, your garden will be relatively low-maintenance and needing much less attention, since it is now a healthy, living, breathing, self-regulating ecosystem. Food for thought: a single handful of healthy soil contains more microbes than there are people on earth. 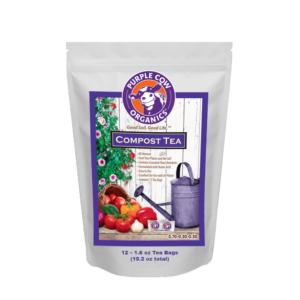 An interesting and unique way to supercharge your garden, Compost Tea is a liquid nutrient and microbial solution you brew up yourself, using Purple Cow’s 2 ounce “tea bags.” The resulting tea is a balanced and diverse food resource to encourage the proliferations of naturally occurring soil microbes, with an emphasis on fungal development. Scientifically blended and independent lab tested. It’s tough to say how effective this is for the plants. I will say that it’s well packaged and easy to use. I apply it when I feel a tree/plant needs a quick hit of liquid goodness so in that way it’s been valuable. 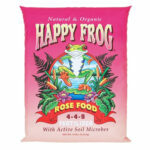 Worth a try, one bag goes a long way and I use the leftover dirt directly in the garden.